Britain reopened its embassy in Iran's capital Sunday, nearly four years after it closed following an attack by protesters who stormed the building. 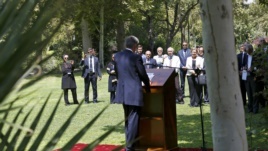 British Foreign Secretary Philip Hammond was in Tehran for a ceremony where he declared the embassy open. He called the visit Sunday a "historic moment" in relations between the two countries, noting it was the first visit by someone in his position since 2003. Ahead of the ceremony, Britain's Foreign Office said Iran's Embassy in London would also open at the same time, initially at the charge d’affaires level, with the aim of installing ambassadors at both facilities in the coming months. Hammond cited improved relations with Iran, saying a diplomatic thaw was first noted two years ago with the election of reputed moderate Iranian President Hassan Rouhani. The Foreign Office said a small British trade delegation was accompanying Hammond to discuss future trade opportunities made possible by last month’s landmark nuclear agreement. But Britain said reopening the embassy was not itself connected to the nuclear negotiations. It called Iran "an important country in a volatile region" and expressed the importance of having embassies even in places where they operate "under difficult conditions." Britain said four years ago that the attack on its diplomatic compound could not have occurred without the tacit approval of the Iranian leadership in power at that time. The violence erupted after the Iranian parliament voted to expel the British ambassador in retaliation for Britain-led sanctions against Iran’s banking sector. Swarms of students penetrated the British facility, tearing down the British flag, burning offices and destroying a painting of 19th century British Queen Victoria. London responded by cutting diplomatic contacts to their lowest level, while not severing ties completely.